For Carter Center observer Antonia Staats, traveling by car in the Western Region of Nepal is a blessing and a curse. A car is necessary for reaching all of the region's 16 districts, where for six months last year, she monitored Nepal's challenging path to a new government and long-term peace. But with poor infrastructure in many parts of the country, Staats and the other observers on her team often encountered roads that were submerged or blocked by landslides from a monsoon. The car would be left behind, and the team would walk for several days to reach remote villages. The curse would become a blessing, however, because traveling on foot made Staats' job of talking with ordinary Nepalese about politics easier. "Driving straight up to someone's door in a Jeep can be intimidating to the person," she said. "You're much more likely to strike up a conversation about Nepali politics and local dynamics when walking next to someone on a footpath." For the past two years, Carter Center observers have traveled around the country, assessing progress and reporting their findings as Nepal has undergone major transformation. Within the last five years, the Asian country has gone from monarchy to electing a constituent assembly charged with drafting a constitution. Since the 2008 elections, which The Carter Center monitored, progress has been slow, hampered by a change in government, political infighting, and a climate of mistrust. Further, though the constituent assembly represents the most diverse elected body ever in Nepal, representing women and marginalized groups from all regions, opportunities for public participation and input have been very limited. The Carter Center has extended its post-election mission to continue monitoring developments after the Constituent Assembly failed to promulgate a constitution by the May 28, 2010, deadline. The Center will continue to assess local developments and provide information to key stakeholders during the next year as lawmakers seek to establish a constitution and governing structure in Nepal. The work of the 15 Carter Center long-term observers is filling an information gap between what happens in the capital, Kathmandu, and what happens elsewhere. "Government tends to centralize in Kathmandu with the party leaders, so we have been paying attention to the local level to see what they understand of the process and listen to their beliefs," said David Pottie, associate director of the Carter Center's Democracy Program. Carter Center observers have found that their job is a two-way street. By working firsthand with local citizens, the Center has been able to help inform parts of national debate that would have otherwise gone unnoticed. "Our observers are individual bearers of information. They educate and get the opinions of people in remote villages who may not have even seen a government official since the 2008 elections took place," said Pottie. The observers' findings form the basis of regular reports by The Carter Center, which provide information and insight based on visits to diverse destinations throughout Nepal and, most importantly, a cross section of the Nepali people when few other agencies or news sources do so. Carter Center staff maintain regular contact with Nepal's political leaders and meet with them formally several times a year to discuss findings. With the constitutional drafting deadline looming, Nepal's assembly must clearly identify the constitutional points on which they agree and disagree if only to demonstrate to the people of Nepal what work remains to be done. "The life of the constituent assembly may be extended," said Pottie, "but it should not test the patience of a population still waiting to rebuild from the civil war, seeking jobs, and deserving of better policing and government services." 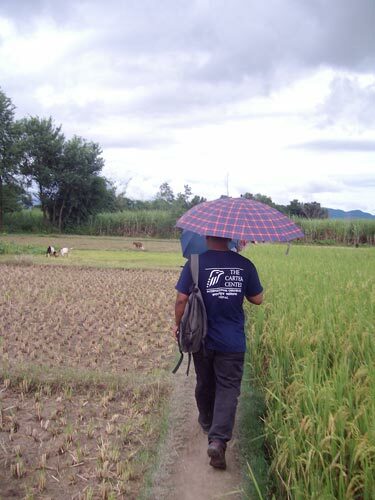 A Carter Center observer walks through rice fields in the Tarai, Nepal's flat and hot south. On this trip, the observers visited several villages to talk with farmers, teachers, and other citizens about security concerns in the area.